For those living in coastal areas, sea gulls are causing considerable problems, and that’s why they keep looking for good seagull repellent measures. The biggest problem is their nutritious rich droppings on which bacteria infectious and dangerous to human beings breed. Seagulls are aggressive birds and are capable of swooping down to grab your sausage roll off your hand on the fly. If you try to fight them they could scratch or bite you. If you carelessly leave your garbage can open, they would make a mess of it by spilling and dragging its rotting contents all over the place. 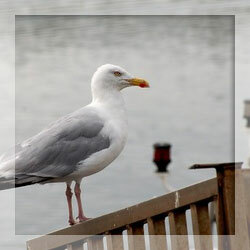 The following are a few of the most common but effective seagull repellent methods of overcoming seagull problems. It is a common sight in these areas to see seagulls perched on rooftops in large numbers taking intermittent breaks from their food hunting activities. In the process they discharge a large quantity of droppings on the rooftops and some of these drip down from the roof edges. This could accumulate to a very big quantity over a long period of time if allowed to go on unabated. The most common solution adopted to this problem is the installation of non-corrosive blunt plastic spikes on roof tops. Seagulls cannot rest their feet comfortably and stay on them except for very brief periods, as they feel insecure and unstable to perch this way. This is quite an effective way for discouraging seagulls perching on rooftops, although to cover large areas is costly. People with extensive roof areas to cover fix a long metal wire stretched across two points as a further option for seagulls to land on, to lure them away from concentrating on the rooftop. If seagulls are allowed to rest over long periods on the wire, there is the greater problem of their droppings falling right below the wire, in addition to adversely affecting any others who happen to be passing below it. This problem is overcome by having two springs mounted at the two edges of the wire which makes the wire swing to and fro when a seagull lands giving them a feeling of instability, which again discourages them from resting for long periods on the wire. Bird Nets are best for protecting large areas including roofs, walls or entire buildings from seagulls. They are made of synthetic material and last for over ten years. It acts as a transparent medium for viewing purposes causing no obstacles to those inside and outside to see one another. Mesh size is important depending on the species of birds from whom protection is sought; and for seagulls, the required mesh size is 75 mm. If all other options fail or cannot be made to work properly due to various reasons, you can consider getting the closest seagull nests moved away. Seagulls are protected animals and the moving of nests can only be carried out by those licensed to do so. If you try to do it yourself you will be doing something illegal; and besides, seagulls are very aggressive birds and could attack you. Only the licensed professionals have the required training, experience and the proper equipment to do such an operation. When their nests are moved, the seagulls too would move away from the area.